In round 3 of the current 6-round Pittsburgh Chess Club Tuesday night tournament, I played a very tense game that led to an unusual position with beautiful tactical possibilities. 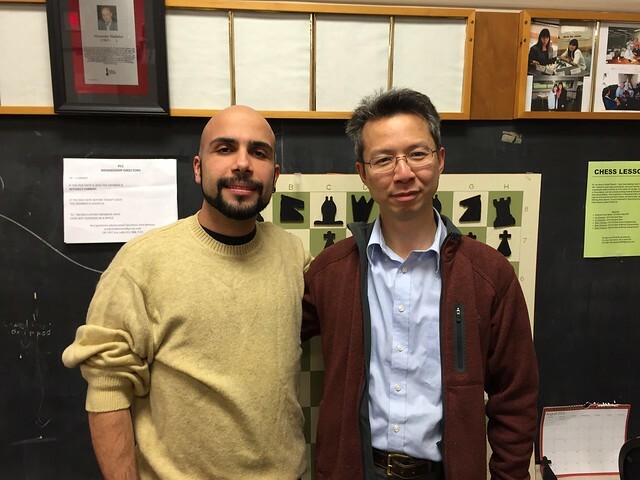 My opponent, Melih, is a strong player who is a winner of the 2015 Pittsburgh Chess Club Championship earlier this year, and had won the last two tournament games we have played, so I came into this game anxious and also thirsty for revenge. The game proved to be very challenging for both of us. I achieved a better position out of the opening as Black but was too cautious to press more aggressively. After more than 3 hours (!) 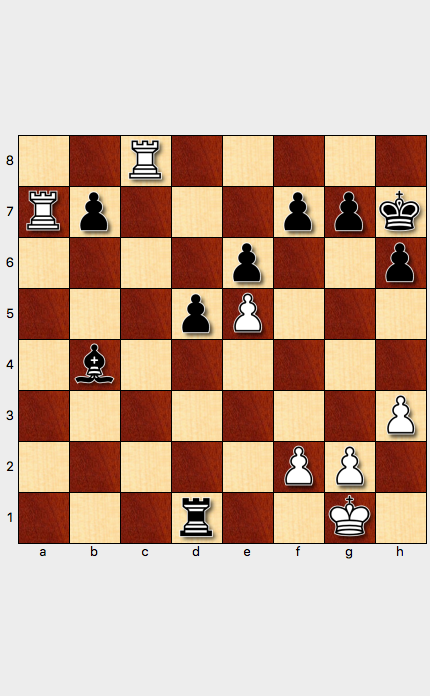 of play, we ended up in a simplified late middlegame in which I had only a small but clear advantage. We were both clearly physically and mentally exhausted, and starting to run out of time (these tournament games have a time control of 2 hours per person with a 5-second delay per move). It was up to me to try to find a way to win by inducing errors in his play. Get ready to be quizzed! What ended up happening was in retrospect both remarkable and comic. To maximize your entertainment as well as challenge your tactical skills, I recommend pausing at each diagrammed position below in order to ask yourself what move you would play, and why, before gradually uncovering the whole story. Note: an interactive chess board with all variations is provided at the end of this article. For context, here is the position after 21 moves, after Black played 21…Qc6. 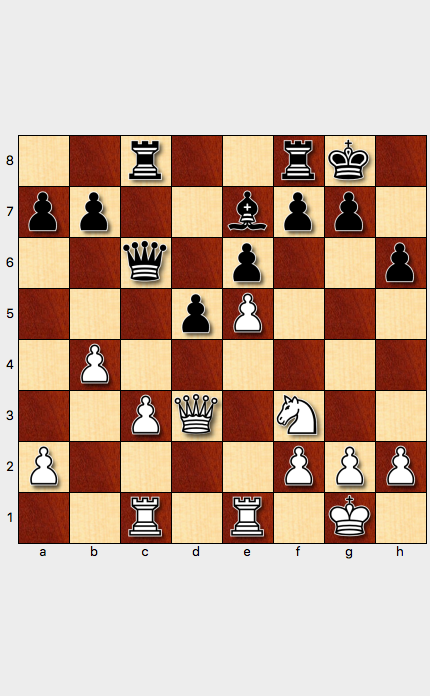 What opening do you think this middlegame came from? Who stands better and why? What is White’s best plan, and what is Black’s best plan? 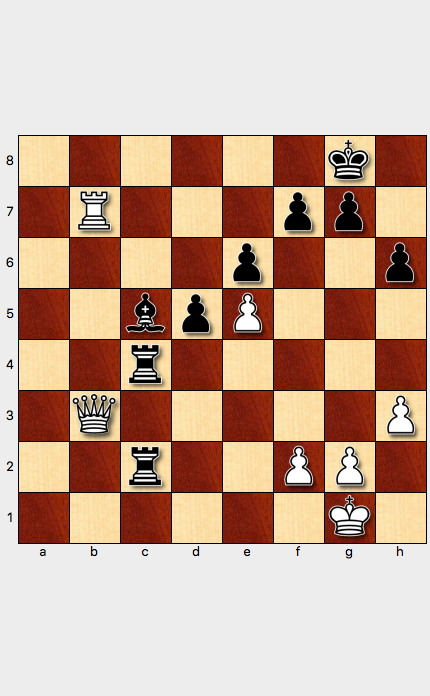 Congratulations if you guessed this was a French Defense, Advance Variation, gone totally wrong for White! Black has just played 28…Rc4. 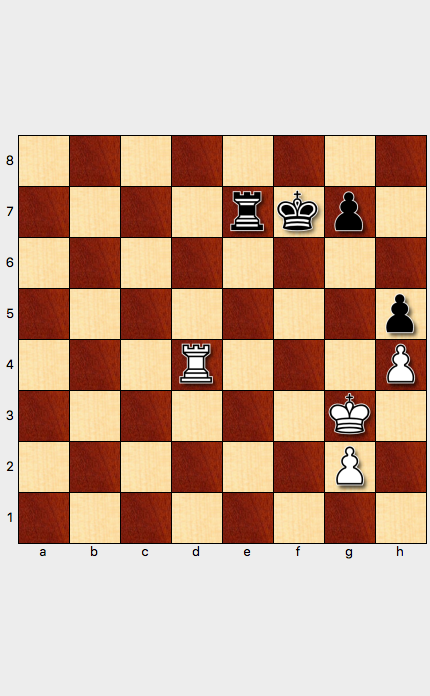 Who has made more progress in the last seven moves: White or Black? What is the nature of the progress made? using the Queen to bear down on White’s a-Pawn, which White has (mistakenly) advanced to a3. White has just played 29 Rac2. On the 29th move, White moved the Rook from a2 to c2, leaving the defense of the a3 Pawn. What is the meaning of this strange move?! Can Black just take the Pawn with the Queen? You may be thinking “White is provocatively setting a trap for Black to fall into”. You get credit if you can see the trap. Black fell into a trap? But wait, I took the Pawn! Did I fall into a trap? What is the trap you saw earlier, if you saw it? Is it really a trap? White has played 30 Ra2. So the Rook moved back to a2, apparently trapping Black’s Queen. But again, was it really a trap? You get credit if you saw this move taking White’s Knight on d4, and saw that White’s Queen is overloaded such that retaking the Rook in either one of two ways leads to losing back the Rook on c1 and therefore losing a piece overall and the game. When Melih moved his Queen to c2, I was in shock and disgust at myself: in my fatigue near the end of this game, and overexcitement at believing I had “refuted” a “trap”, I had completely failed to take into account that White was not actually required to take my Rook on d4! Amusingly, it turns out that Melih, after playing 29 Rac2 setting the “trap”, saw to his horror the resource 30…Rxd4, and thought he was lost, but then saw 31 Qc2. So neither of us had originally seen this saving resource for White. Is Black’s Queen trapped for real now? What should Black do? Is Black lost? Or is Black still winning? Or should Black start looking for a draw? Yes, Black’s Queen is trapped for real. You get credit if you saw that Black’s flashy 30…Rxd4 had this flaw. The only question for me was how best to give up my Queen. I chose poorly. In a daze, I could not think straight. I chose to give back a Rook with 31…Qxc3, in order to force a trade Queens on c3 and go into an endgame an exchange down for two Pawns, and hope for a draw. 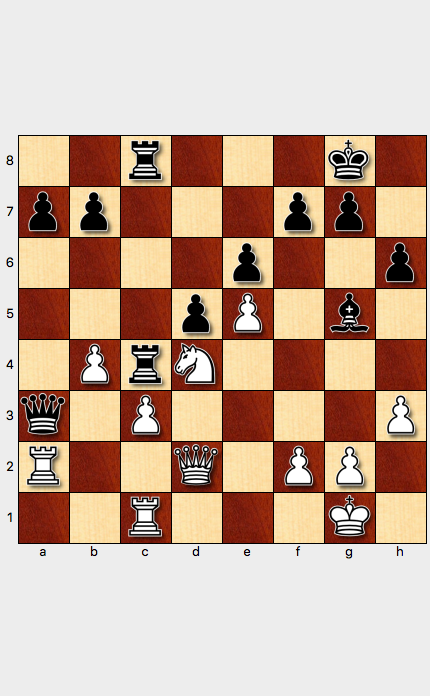 In fact, if you saw all this when thinking about whether to take the Pawn on a3 in the first place, then you get bonus points for seeing a way to an advantage through the sequence of tactical blows. Neither Melih nor I saw any of this up front, unfortunately. I chickened out and did not take this continuation because after being shocked that my Queen was disappearing, I experienced a visceral fear that I needed to bring down White’s Queen also, else it with White’s Rook might be dangerous to my King. It turns out that my fear was objectively unwarranted, as Black’s defenses are sufficient because of the power of the dark-squared Bishop to hit White’s e5 Pawn and even the f2 Pawn, but I was not thinking straight any more as time was running out for the four-hour game and it was already around 11 PM at night on a weekday. The thing is, even though the computer says Black has an advantage, it could be scary playing against White’s Queen. In time pressure, anything can happen, and I think it would have been very likely that White would have grabbed the a7 Pawn, after which Black’s position play itself. I said you get extra credit for seeing everything to the point of sacrificing Black’s Queen for an advantage. But you only get full credit if you saw the real refutation of White’s “trap” earlier in the game! I kicked myself for not having seen it. Was there a point at which Black could have deviated and won the game outright? Hint: which of Black’s pieces have we not focused on in the variations covered so far? Black could, after White “trapped” the Queen with 30 Ra2, used a different and better deflection of White’s overloaded Queen than 30…Rxd4, which was OK but not best. We haven’t looked at Black’s Bishop enough. I only saw this upon recovering from the draw and analyzing the game later at home: the winning shot is 30…Bg5! Either way, the endgame is an easy win for Black. Neither Melih nor I saw this winning resource for Black during the game. We just weren’t looking at that quiet Bishop because it hadn’t participated in anything up till that point. Chess never ceases to surprise me. Tactical possibilities are everywhere, and in this game, both Melih and I missed various possible continuations, playing moves thinking we knew what had to follow. I hope you enjoyed this story of missed opportunities and incomplete calculations. 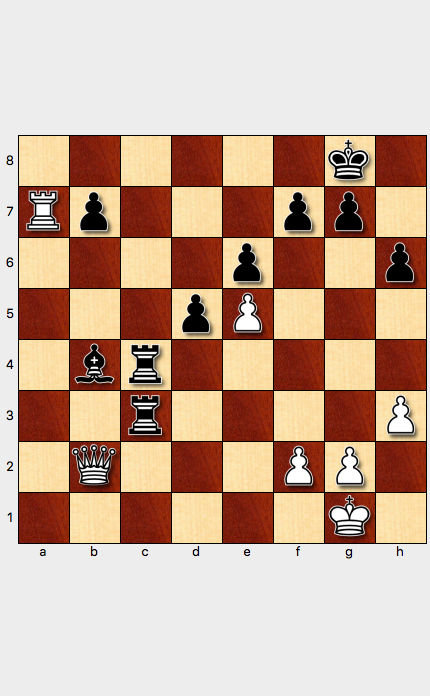 My thanks to Melih for a challenging and fascinating game, and sharing his thoughts with me afterwards.